WASHINGTON, WASHINGTON DC, UNITED STATES, January 31, 2019 /EINPresswire.com/ — These days, modern customers are always researching on online reputation management to know how it can impact on the businesses. It is a fact that an online business reputation is a crucial thing which can make the company sink or swim. Thus, recently GoodFirms survey explored the importance and positive impacts of online reputation management for business along with top tips from professionals on how to respond to negative customer reviews. In the online reputation management survey, 500+ firms and experts participated and shared the acquainted knowledge to build a strong reputation and to deal with positive and negative feedbacks. Of particular note considering this survey, 92.6% of brand reputation companies and experts agreed that online reputation is essential and priority thing for any business. 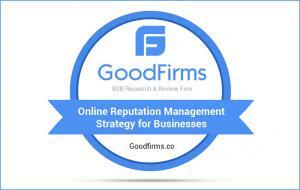 GoodFirms is an internationally renowned B2B research, ratings and reviews platform. It connects the service seekers with Best Branding Agencies and other IT development companies that are evaluated with a number of some metrics. The research process is based on three vital factors that are Quality, Reliability, and Ability. These metrics are incorporated with many other statistics such as determining past and present portfolio, on-hand experience in their proficiency, market penetration and client reviews. After this method, all the firms are differentiated and are allotted points that are out of total 60. Then index the exceptional agencies in the list of top companies, best software, and excellent firms from various segments. GoodFirms also surveys trending topics to reveal the insights and share it with the customers. Additionally, GoodFirms supports the service providers by asking them to involve themselves in the on-going research. To enhance their chance to get listed in top companies, they can provide a strong portfolio. Getting indexed at GoodFirms can help in being more visible to customers from worldwide. Here GoodFirms has also uncovered the list of Top Social Media Marketing Companies based on knowledge, experience, and many other metrics. GoodFirms is a Washington, D.C. based research firm that aligns its efforts in identifying the most prominent and efficient custom software development companies that deliver results to their clients. GoodFirms research is a confluence of new age consumer reference processes and conventional industry-wide review & rankings that help service seekers leap further and multiply their industry-wide value and credibility.